​Every day, millions of people enter "keywords" into Google for various things they are looking for and Google responds by displaying a number of websites that are relevant to the keywords they have entered in their search. The higher your website ranks in these search results, the more likely it is that a potential customer will find and click through to your website. With countless people searching for your services online every day, the objective is to attract some of those relevant people looking for what you have to offer and bring them to your website. This is the process by which businesses get new customers by being online. Initiating Web design and website development are the first steps to entering the online world and accessing new customer opportunities. 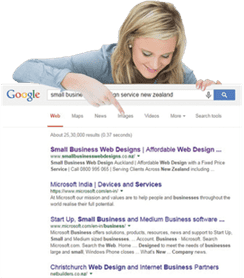 Small Business Web Designs offers an extensive guide to SEO in New Zealand. Whether your needs are website development or an SEO boost, our guide informs and educates. Whether you are a large Auckland business or a growing service provider in Wellington, SEO is critical to all website design. Understanding SEO and how it works with every web design is essential. Why is SEO Important in Web Design? Search Engines are used every day by millions of people to look for information online. The most commonly used search engine is Google, followed by Yahoo, Bing and a few others. To help us explain SEO, we will talk about the most commonly used search engine in New Zealand, Google, and understanding how Google works is critical to our web design clients. Say you’re looking for a motel in Auckland. If you wanted to find Blooglobble’s Motel in Auckland, you might type “Blooglobble Motel Auckland” into google.co.nz. It comes up first because it’s an extremely close match for the search term. However, if you don’t know the name of the motel, and just type “motel Auckland”, Parklane Motor Lodge comes up first – Blooglobble Motel doesn’t even appear on the first page. A ranking in the #1 position on the first page of Google for a keyword will often get approximately 40% of traffic coming to their website... this is why it's a highly coveted position! No amount of expert website design brings such results - the answer lies in SEO efforts. Firstly, your website will rank differently for each keyword you type into Google. For example, if you provide massage therapy services in Auckland, and you want to rank on the first page of Google for "Auckland massage", the chances of ranking on the first page naturally are low because this is a very competitive keyword. That means that there are many other websites that have been engaging in long term SEO efforts to boost their website ranking (likely for years) to reach the first page of Google and you will be competing with them to try to outrank them. However, if you have a unique business name, such as "Ezgislom Massage", it's unlikely that other websites have been trying to rank for this keyword, so you are likely to come up on the first page of Google as it's lower in competition to outrank other websites. Less common, more specific and unique keywords are likely to rank higher because they are more targeted and have less competition - these are referred to as "long-tail keywords". For example, a keyword such as "Auckland pineapple facial massage" is unique, very specific and less competitive to rank for in the search engines so you can rank highly for this. Importantly though, there is no point in ranking high for a keyword that no-one searches for! Generally speaking, your unique business name should be able to rank on the first page of Google with on-page SEO alone. There may be some circumstances when it does not but there are always ways to keep working on it to boost it and we are always here to help you with more ideas. When it comes to more competitive keywords (which generally incorporate more general, broad words), we cannot guarantee that you will rank on the first page of Google. However your website can still get found through search results for these words in numerous other ways which is why it's important to keep working on your website's reach and marketing. 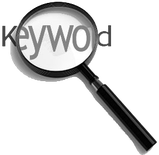 We will still incorporate competitive keywords in our keyword selection for your business for this reason. We conduct a Google Keyword analysis to identify the most relevant keywords for your business, region and related keywords that are searched for by Google by users. These words are provided to us from Google keyword data and once we have generated a list of keywords, we select the most relevant keywords that are appropriate for your website and which also have reasonable search-volumes according to Google data. Therefore, we select keywords that are being searched for. Some of these keywords are competitive, others less so if they are more targeted. It is still important to use all of the most relevant keywords even if they are competitive as they will still help your website get found through search results, even if not on the first page of Google. At Small Business Web Designs, we strongly believe in continued education about Search Engine Optimisation (SEO) and ongoing efforts to build your website's authority which will ultimately help it to rank higher. Our aim is to partner with you in achieving new leads through your website and we are here with you through every step of the way. Please know that you need to be invested in your website as much as we are in order to take advantage of the power of the Internet. We are not an SEO provider, but we can provide you with crucial information and actionable tips that you can do yourself to increase your rank. Do You Recommend Any SEO Providers To Get To Page 1 Of Google? At this time we do not recommend an SEO provider for long term off-page SEO. 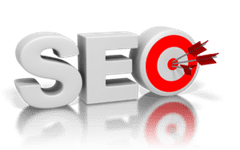 We have not had an experience with an SEO provider that has proven their works to us to be effective and shown first page results in the time they specified. Personally at Small Business Web Designs, we do our own SEO to our website and that has been the only true path to our website rankings! While we know SEO extremely well, our business does not offer this service at this time. In the next 12 months, we will be staging the release of various SEO services that you may be interested in, such as social media campaign management and blog posting, which are two of the most effective SEO things you can do, among others. We will keep you posted as we release these services in coming months. Are There Any Things I Can Do Without Paying For An SEO Provider?